My Tuesday recipe is going to be Granola. 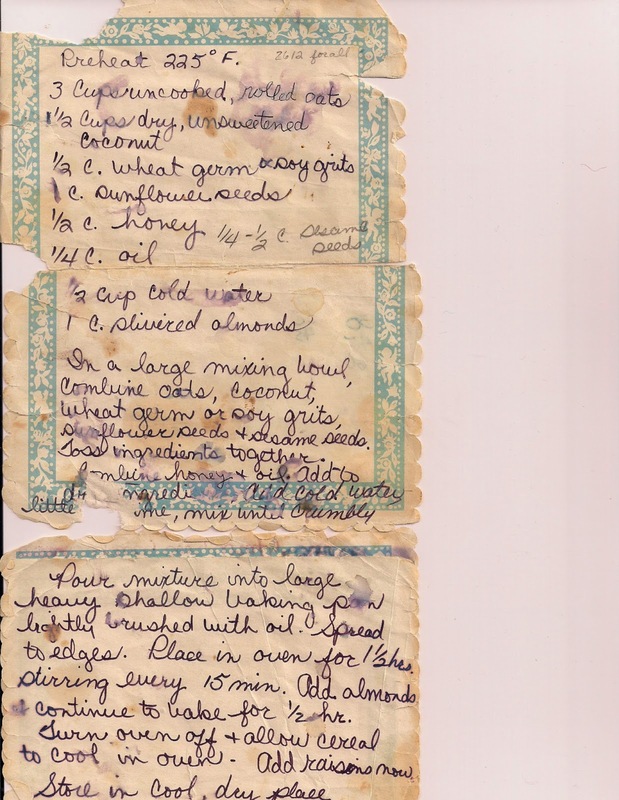 Back in the early 1970's I got this recipe from a long time family friend. I have known Wendy for more than 50 years. She was my sister's best friend when they were little. Our children are nearly the same age and we went through the organic gardening and healthy eating phase together. Actually we are still trying. This is the original recipe. It's in pretty bad shape but still readable. Here is the translation. In a large mixing bowl combine oats, coconut, sunflower seeds and sesame seeds. Toss ingredients together. I left out the wheat germ. Combine honey, oil and water and add to dry ingredients. Mix until crumbly and spread in a large shallow baking pan. Place in oven for 1 1/2 hours, stir often (it says every 15 min. but I don't do it that often) Add the almonds and continue to bake for another half hour or until the granola is light brown. Turn the oven off and allow the cereal to cool in the oven. You can add raisins or craisins if you like them. Store in a cool dry place. Apparently you can make Granola Bars by mixing two cups of the cereal and two well beaten eggs. Then spread on a lightly oiled cookie sheet, pressing firmly. Bake for 20 minutes, cut into bars but allow to cool before breaking apart. I have never done this but I may try some day.